4Humanities@UCSB will hold its second meeting of the 2013-14 academic year on Thursday, November 21 (noon – 1:30, South Hall 2509). Following up on its previous meeting, which focused on the “Heart of the Matter” report produced by the American Academy of Arts & Science’s Commission on the Humanities and Social Sciences, this meeting will be devoted specifically to designing a technical and interpretive strategy for digital-humanities analyses of the WhatEvery1Says corpus of statements about the humanities that 4Humanities has been gathering. If you are interested in learning about such methods of analysis as they might help support humanities advocacy, please come to the meeting. What are the common “themes” (ideas, theses, evidence, metaphors, etc.) that divide or join people discussing the humanities? What are the lower-level or latent themes beneath those everyone “knows”? What are the outlier themes? What are the patterns of connection between themes, between spokespersons, and between media outlets? How do themes compare across time? How are themes differentiated by nation, region, gender, age, etc.? Possible plan: start project at UCSB, then ask for critique of methods and further help from international DH community. Who at UCSB might want to participate? Involvement of students from the “Writing and Civic Engagement” minor in UCSB’s Professional Writing program (serving as interns)? Textual documents (not audio or video resources). Documents more-or-less in the public milieu (including journalism, blogs, reports, white papers, etc., but not scholarly studies or research). Documents sized between posts/articles and reports (not books). Most documents in the corpus are from the last two years. We need documents from past periods. Most documents in the corpus are from (or address) the North American context (with some representation of the U.K. and other nations/regions). We need more documents from other parts of the world. Text cleaning and preparation: Python scripts or other tools for fixing common errors, standardizing spellings, resolving hyphenations, etc. (Cf. Ted Underwood and Andrew Goldstone’s scripts and other resources for topic modeling). Consolidating semantically unitary bigrams into unigrams (e.g., “social sciences” into “social_sciences”). Filtering out proper names (experimenting with named-entity recognizers). Experimenting with parts-of-speech taggers (POS) to filter out everything but nouns (cf. Matthew Jocker’s topic-modeling work). “Chunking” (breaking documents if needed into appropriately sized subdocuments). Experimenting to see if we should use the full-featured Mallet topic modeling suite or its Java implementation (Topic Modeling Tool). Experimenting with different parameters for the topic modeling, most importantly: number of topics to ask the algorithm to produce. Interpretive labeling of topics (and visualization of topics). Creation of interactive site for exploring the topic model of WhatEvery1Says. 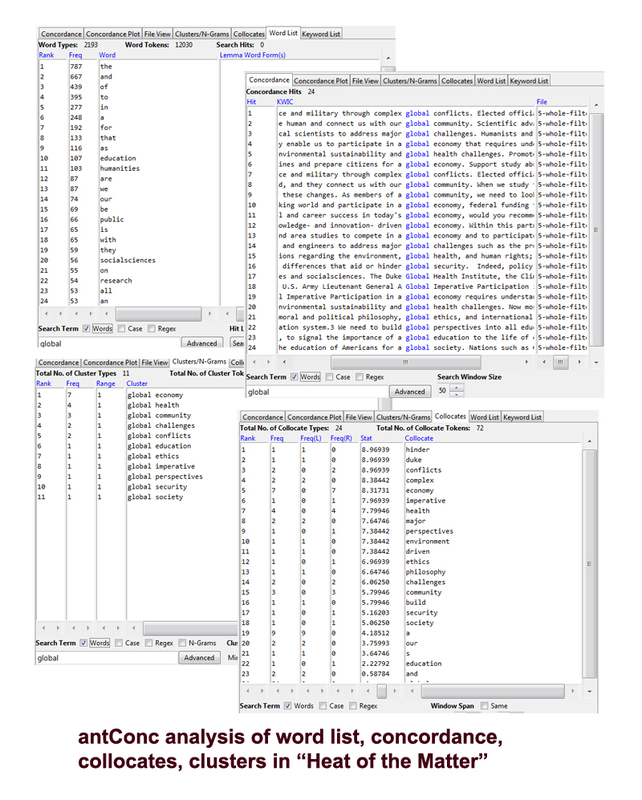 (Cf., DFR-Browser, a browser-based visualization interface created by Andrew Goldstone for exploring his topic model of JSTOR articles). Co-authored research report or article on outcomes. Workshop to brainstorm ways we can apply the outcomes in facilitating, guiding, or creating advocacy arguments and materials. Will this meeting be streamed for those not in Santa Barbara? I wouldn’t mind listening in.